I'm a big fan of research--it's so crucial to so many aspects of our lives. Designing safety standards for car seats, baby cribs, toys, our homes, our food. Creating safe & effective medications & vaccines, treatments for health conditions & injuries. A lot of us wouldn't be alive without it. Or our lives would be a lot worse. While I'm not a researcher, I'm happy to have the opportunity to contribute to research & I think it's a great learning opportunity for my kids to do so as well. When I was still pregnant with Linny, I joined the CHILD Study, along with 3400 other families across Canada, to contribute to research on the prediction, prevention, & treatment of chronic diseases. The study was initially designed to go from prenatal to age five, but they extended it & we were happy to continue on, now going on nine years. Linny & I have also participated in a few other studies at UBC & SFU, one of which he even got to wear an EEG cap. 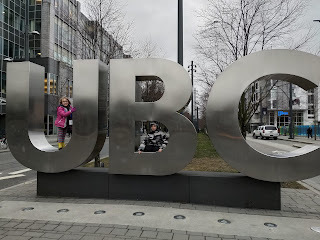 Bronte hadn't had the chance to be a part of research until recently, when I signed both kids up with the UBC Early Development Research Group. 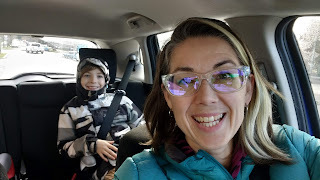 We got the call that both Linny & Bronte could participate in two studies with the UBC Centre for Cognitive Development & scheduled in a visit on a weekday after school. We hopped on a bus , then walked through the campus with a little climbing here & there along the way, & arrived at the research lab in about 45 minutes. The kids both did two different computer "games" as part of the research, which related to kids' ability to estimate quantity. I relaxed in the waiting room, & they were all finished within about a half hour. Afterward, each child was presented with a "Bachelor of Arts" certificate for participating, as well as a choice of a toy, book or t-shirt. 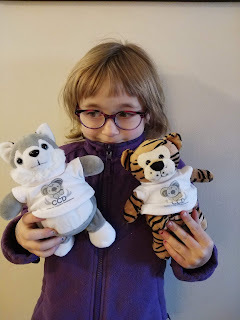 Unsurprisingly, they both picked the cute stuffies. I've had some interesting conversations with the kids about why research is important & how it can be used to help people have better lives. Some of the things the Linny has been exposed to in the CHILD Study, for example, has been quite useful to help him be a little more comfortable with medical procedures, since the researchers there are so patient & strive to make the experience as positive as possible. The study we participated in at UBC was completely non-invasive--just sitting at a computer with the researcher & choosing one of two things shown on the screen--but I think it's still useful to teach the kids the value of contributing in a small way to something bigger than themselves that could help other people. If you're interested in contributing to research like this with your children, you can sign up for the Early Development Research Group online. They are always looking for participants from birth right up to early teens. 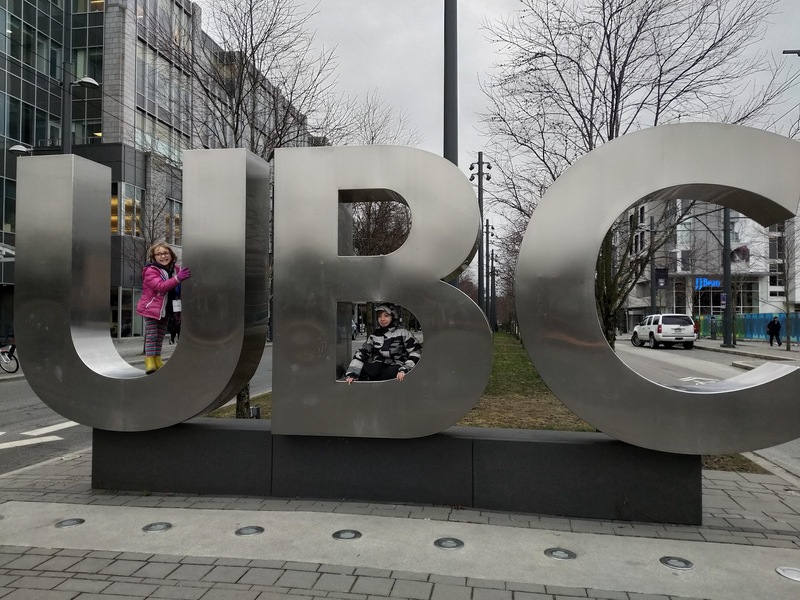 This research group is part of the Psychology department at UBC, so their research doesn't involve any invasive medical tests, generally just ordinary day to day activities like talking, playing, or watching video. Their website has more information on what a typical visit looks like. Have you put away your bike for the winter & are dragging your feet about getting started riding again? Or maybe you haven't ever ridden that much but you'd like to start? Joining a month long challenge like 30 Days of Biking can be a great incentive to set a habit & launch yourself into active travel for the rest of the year. One caveat, it's not a contest--nobody is keeping track of kilometres travelled, personal best speeds, or hours spent in the saddle. & your rides don't have to be long or even go anywhere--if, at 10pm on a Thursday in April, you discover that you haven't biked anywhere yet, you could just hop on your bike & ride around the block. If you really want to ride every single day in a place like Vancouver, that means that you're likely to end up riding in the rain at least a few days in April. 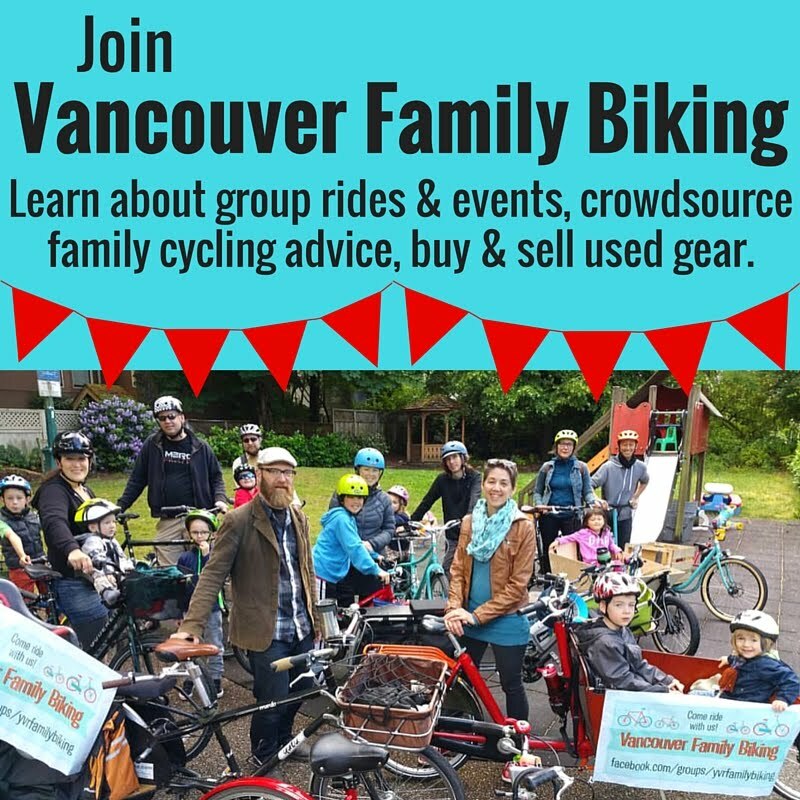 This could be a great opportunity to try out wet weather biking if you've previously been a "fairweather" cyclist in the past. If you're looking for rainy day gear advice, check out my review of the People's Poncho. Even if you, like me, ride most days already, & the challenge won't make a huge difference to your biking habit, it's also a nice little reminder to share our rides with other people. I've gotten so used to just heading out the door on my bike & I feel like I could probably take a few more photos & share a little more, just to show people how we live car-free with kids. I come across people all the time who just can't envision what bringing two kids to school in the morning looks like on a bike, or how in the world you'd carry groceries for a family of four, or what winter or rainy day biking looks like. Let's get the word out, shall we? Head over to the 30 Days of Biking website, join me & the 1400+ other riders who've pledged to ride every day in the month of April, & start Instagramming/Tweeting/Facebooking your rides with #30daysofbiking! 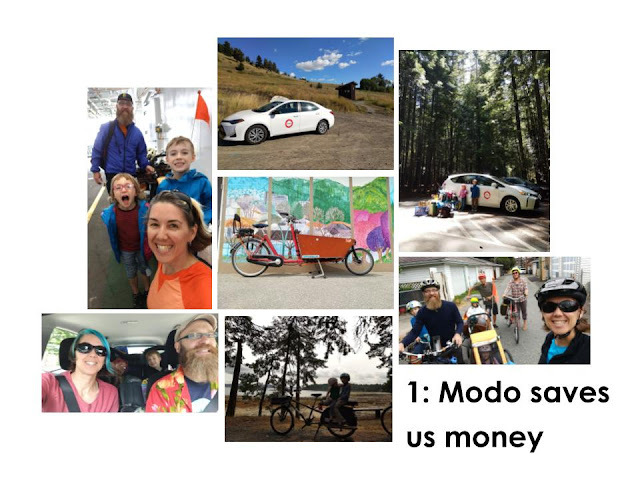 Modo gave me the opportunity to speak again as one of their Blogger Ambassadors at the annual HUB Bike Awards on February 28. It's always funny to go on stage to talk about driving at a cycling event, but stay with me here--cycling is actually relevant to Modo in my experience. Here's the text of my speech at the event, plus the images from my slides, in case you missed it. I've got just three minutes, so I made a quick listicle for you. 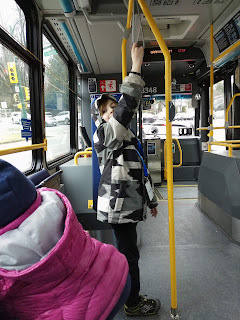 In January, I decided to total up our transportation costs for last year, including travel. 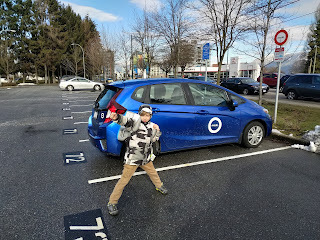 Our biggest category, unsurprisingly, was biking: repairs, then Modo car sharing, a few Ferries, some Poparide ride sharing, plus a little Transit. The total came to: $3520. For comparison sake, if we'd done the majority of that by car, we'd have needed to own two. Based on the average in BC, that would have cost us about $19,000 last year. !! Since we spend well under $4000 on getting around, that's a savings of over $15,000! 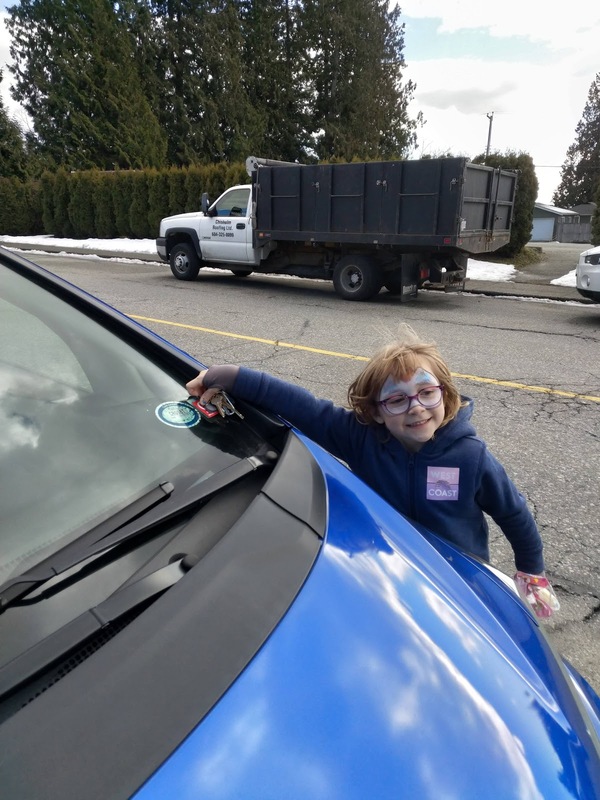 I know a lot of Modo's messaging is about how fun it is, how much money we save, how we have access to all different types of vehicles, & how easy it is to book... This is all true. 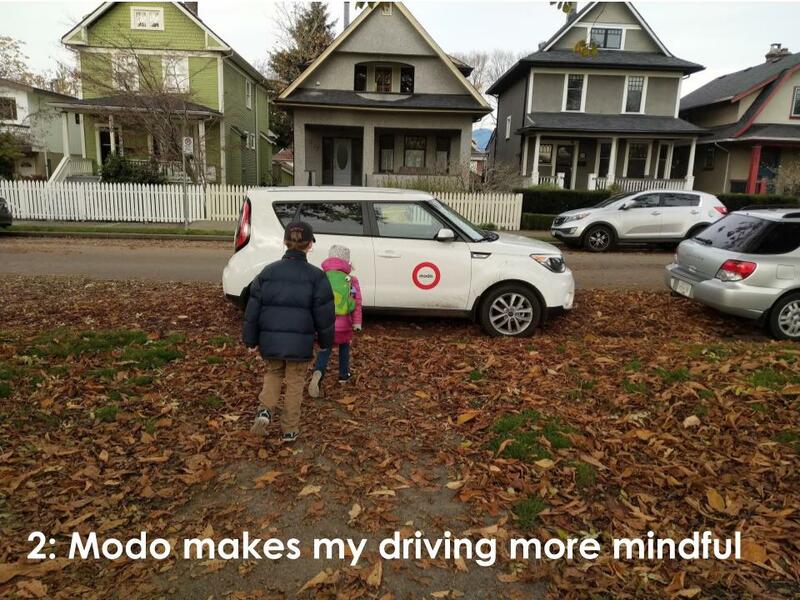 But part of what I love about Modo is the *inconvenience* of carsharing. Because, let's face it, I am a little lazy. I want to get there in the fastest, easiest way possible. Which, if I had a car sitting out front of my home, would often be driving. Because I *don't* own a car, I have to take a few extra steps to book a car, then walk a couple blocks to go get it. Plus, if you have children, installing the car seats. Compared to this, riding my cargo bike out of the garage is more convenient. So my driving is a lot more intentional. Using Modo & not owning a car makes me less likely to drive & much more likely to bike. The latest new thing for Modo members is here: Open Return! Open Return is a new booking option that allows you to reserve a car for a full 24 hours, & return it whenever you want within that time. 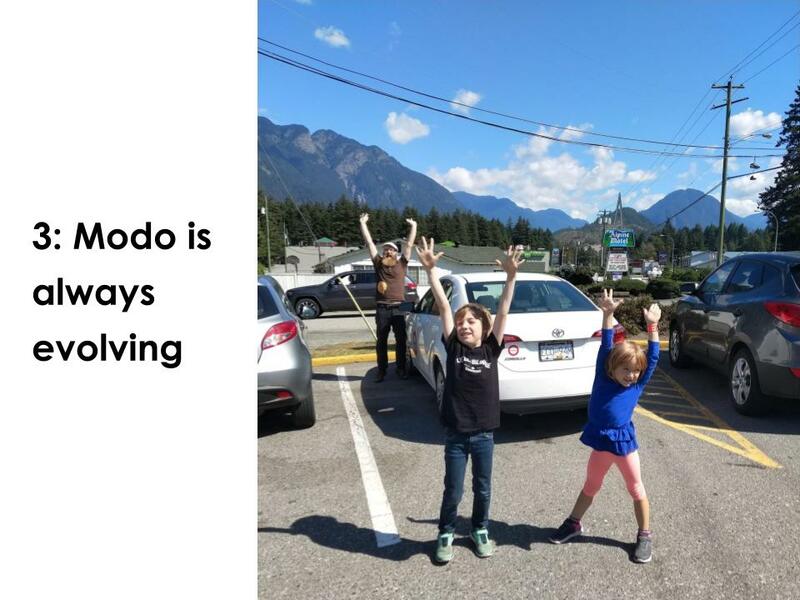 Once you park the car & fob out, you go to the Modo app & end your booking manually, paying for just the time that you used, plus a $3 fee. As I mentioned, we mainly bike to get around, but when we do drive, now we book with Open Return. It's hard to predict in advance how the day is going to go when we're out & about with the kids. Using Open Return means if they get tired we can come home early & save a bit on our booking. Then the car is available for another member to use. Or we can stay out later & not have to worry about rushing home because someone else has the car booked right after us. No need to worry about getting stuck in traffic. & we can squeeze in one more errand on the way home. IF you haven't joined Modo yet, use the code HUBAWARDS2019 to save $50 on drive time when you join! For more about open return, check out Modo's website. Members, if you haven't already, try Open Return on your next booking! 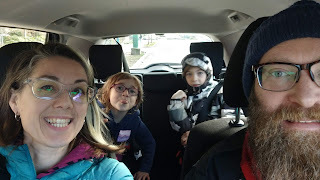 If you'd like to see how we live as a #carfreefamily, you can follow me on instagram, my handle is SPOKESMAMA. Thank you. What is Modo's Open Return & Why Should I Care? I've been a Modo member since before it was called Modo, waaaaaaay back in the days of the Cooperative Auto Network. In the 16 years since I joined, I've driven all kinds of different vehicles. Most of the time we bike, but once or twice a month, for those times when we're going somewhere that is too far to haul the kids in a cargo bike, or the weather is dreary, or we're planing to carry something massive, it's great to have the option of using a Modo. I'm really used to planning out our car usage, figuring out how long it's going to take us to drive to & from our destination, how long to install boosters seats, unload our stuff, how long we'll want to stay wherever it is we're going. But sometimes, stuff happens. Like a collision on the bridge that snarls up traffic. Or we just feel like hanging out with the fam a little longer. Or we remember a thing we could pick up at that store on the way home. Often, we can extend our booking to include the extra time to do this stuff, but sometimes not. It's all part of sharing these cars with the other tens of thousands of members. Sometimes you gotta get back because someone else has the vehicle booked right after you. Until Modo introduced something new: OPEN RETURN. If you haven't heard about it yet, Open Return is a new booking option that allows you to reserve a car for a full 24 hours, & then return it whenever you want within that time. Once you park the car & fob out, you go to the Modo app & end your booking manually, paying for just the time that you used, plus a $3 fee. Cool, right? Like I said, I've been a Modo member for almost 16 years now & I'm used to planning my trips & having a deadline that we need to get the car back by. However, having this flexibility is awesome. Particularly with kids. It can be hard to predict in advance how the day is going to go when we're out & about, so using Open Return means we can come home early & save a bit on our booking. Then the car is available for another member to use. Or we can stay out later & not have to worry about rushing home or checking to see if we can extend or if someone else has the car booked right after us. No need to worry if you get stuck crawling through traffic over a bridge or through a tunnel. Or if everyone is happy & we have not reached critical child meltdown phase, we can squeeze in one more errand that we remember on the fly. Last weekend we made an Open Return booking to go to my nephew's second birthday party on the North Shore. We also had a great visit with the other side of the family & even got in a little hot tub time! It was really nice to just relax & not have to keep an eye on the time or extend our booking. We ended up hanging out longer than expected & just headed home when it was time to get the kids to bed. If you're a Modo Member, have you tried Open Return yet? What do you think? If you haven't, you can find out even more about Open Return on Modo's website right here. Disclaimer: As an Official Blogger Ambassador, Modo provides me with driving credits in return for blogging, tweeting, Facebooking, & Instagramming about our adventures big & small with Modo. Abus Montrailer Ace: Stormtrooper Style? This review has been a long time coming! I got the chance to test out the Abus Montrailer Ace mountain biking helmet in the summer, & got it in time for our camping trip to Newcastle Island. I wore it for two longer days of riding (note: long for me means I was wearing the helmet for two to three hours) in warm weather, as well as a little rain. I wore it to work some more in the fall & meant to write about it before winter hit... but then I got hit by a car. I was wearing a different helmet that day, so can't give real world crash test results for his one! Sorry! The resulting concussion meant I needed to drastically reduce screen time from late October into December to recover. So here we are into February & I'm finally getting out from under the pile of things on my to do list. Off we go! Let's start with style, shall we? 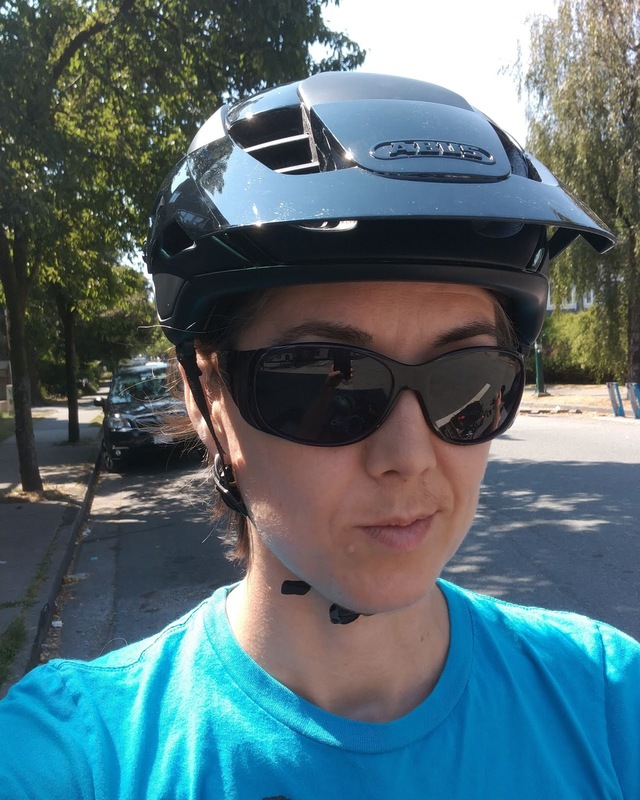 When you're wearing a bike helmet--let's be honest--they all look somewhat dorky. If you're going to wear one (not getting into that debate here) it's basically a choice of what kind of dorky you want. Sporty/Space robot dorky? This one is for you! The Abus Montrailer MIPS gets bonus points for unique style. The air vents & overall shape create a space age look in a matte black. 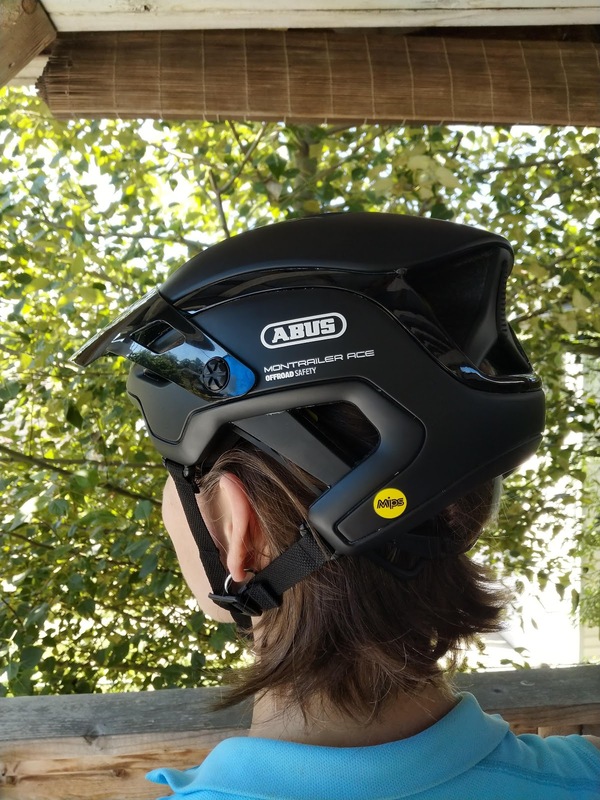 It also manages to look a lot less bulky than other Abus helmets; giving you less of a "mushroom head" when wearing it. The visor, which flips up into several different positions to accommodate goggles (I don't ever use them, but you can see a pic here of how the Montrailer helmet does this), is quite large, solid & translucent to block sunlight but doesn't come that close to your face to impede visibility. The Abus Montrailer comes in six different colour schemes: black, mostly white, or black with turquoise, yellow, red, or pink accents. Okay, enough about looks, how does it feel on? The Montrailer features a dial adjustment at the back, which is easy to use on the fly. The chin strap adjusts the usual way but I found it a bit short. Though I don't have a particularly long face, there is a bit less than 2cm of slack left in the strap. 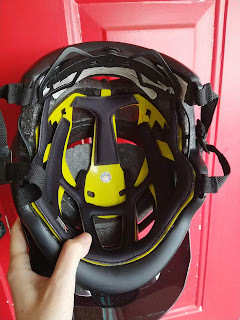 The side part around the ears was a little fiddly to get adjusted but both the side straps & under the chin stay put well & haven't moved in the time I've been wearing it, unlike many other helmets I've had. The buckle is the lateral sliding magnetic type, which generally avoids pinching the neck. This helmet is definitely designed for a more oblong shaped head, I'd say--longer front to back than side to side. 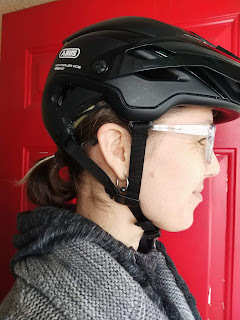 It's higher at the back than the upright city cycling helmets that I typically wear, so if you have a more forward leaning riding position on a drop bar bike or sporty mountain bike, this helmet will allow for that without getting pushed forward when you hunch your shoulders. This helmet also comfortably allows for a ponytail or braids to come out the back. I could have actually had my ponytail higher than shown in the pic here. If you're buying one of these online, & can't try one on in person, I'd highly recommend sizing up a bit. The helmet comes in just two sizes--medium 55-58 cm & large 58-61 cm. Despite following the measurements on the website, I found the Abus Montrailer medium to be tight fitting because the MIPS inside takes up a bit more space. The MIPS is intended reduce injuries from rotational sort of impact--for more details on that technology, see their website here. I assume because of the MIPS the Montrailer is somewhat heavier, weighing in on my kitchen scale at 438g. I don't find this particularly heavy, however, & tend to prioritize durability over weight when it comes to helmets. Which leads me to my next question, what about quality? The Abus Montrailer feels well made. The exterior shell is bonded to the foam & the various parts are precisely made & fit well together, including the sturdy hinged visor. The visor is actually one of the things that helmet companies often seem to skimp on, but Abus hasn't here. That thing is not going to break off & end up in the gutter on a ride. The more durable exterior coating extends around the underside of the edges to protect the foam when you're putting it down. The X-Static pads inside seem good quality & have padding everywhere that your head is likely to contact the inside of the helmet. The Abus Montrailer Ace is the top in a line of three Montrailer helmets, with the Montrailer & Montrailer MIPS. The range varies from $225 for the Montrailer up to $300 for the Montrailer Ace MIPS (in Canada).